Several copies are on reserve. Also available in an online subscription at https://www.legalbluebook.com and as an app for your iPhone or iPad at https://itunes.apple.com/us/app/rulebook/id454619081?mt=8. 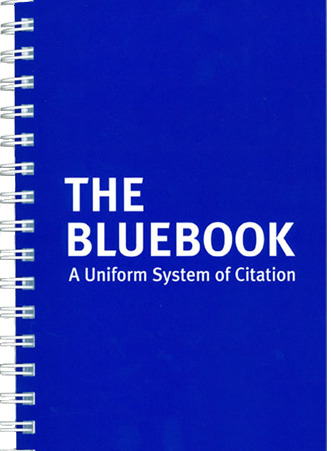 A few citation tips appear on this site and are called Blue Tips https://www.legalbluebook.com/Public/BlueTips.aspx. How can I figure out what an abbreviation or acronym stands for? 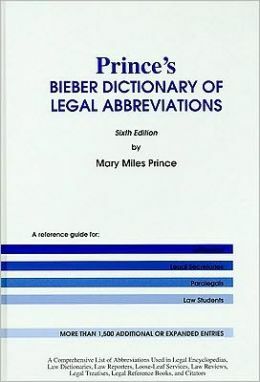 Mary Miles Prince, Prince’s Bieber Dictionary of Legal Abbreviations (6th ed. 2009), REFERENCE SECTION, KF246 .B46 2009 The front of the book alphabetically lists abbreviations and acronyms found in legal citations and provides the full name of the source, while the back of the book starts with the source and provides the abbreviation. Igor I Kavass & Mary Miles Prince, World Dictionary of Legal Abbreviations (1991-), REFERENCE SECTION, K89 .K38 1991 (Looseleaf-latest update in our library is 2006) Deciphers legal abbreviations from dozens of countries around the world. All That JAS http://www.abbreviations.com/jas.php Look up a journal by its abbreviation. Covers all disciplines. Acronym Finder http://www.acronymfinder.com Free online guide to the meaning of over one million abbreviations and acronyms. GovSpeak: A Guide to U.S. Government Acronyms & Abbreviations http://libguides.ucsd.edu/govspeak Free online guide to the meaning of U.S. federal government acronyms and abbreviations.